high throughput, and economical alternative to conventional colorimetric methodologies, such as Enzyme-linked immunosorbent assays (ELISA). marked by deficiencies in the bodyâ€™s ability to produce and properly use insulin. The most common forms of diabetes are type 1, in which the bodyâ€™s ability to produce insulin is destroyed, and type 2, in which the body is resistant to insulin even though some amount of insulin may be produced. The C-Peptide Quantitative Test Kit is based on a solid phase enzyme-linked immunosorbent assay. solution. 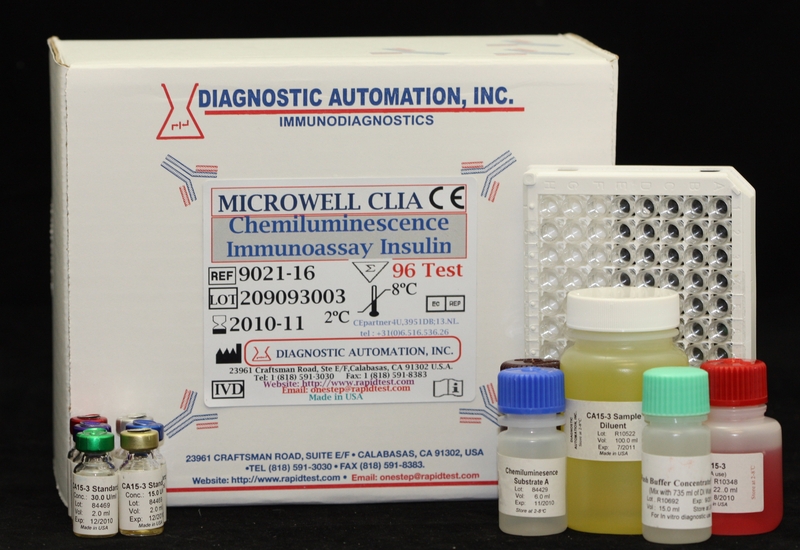 The standards and test specimen (serum) are added to the C-Peptide antibody coated microtiter wells. Then anti-C-Peptide antibody labeled with horseradish peroxidase (conjugate) is added. If human C-Peptide is present in the specimen, it will combine with the antibody on the well and the enzyme conjugate resulting in the C-Peptide molecules being sandwiched between the solid phase and enzymelinked antibodies. After a 1-hour incubation at room temperature, the wells are washed with water to remove unbound labeled antibodies. A solution of chemiluminescent substrate is then added and read relative light units (RLU) in a Luminometers. The intensity of the emitting light is proportional to the amount of enzyme present and is directly related to the amount of C-peptide in the sample. By reference to a series of C -peptide standards assayed in the same way, the concentration of C-peptide in the unknown sample is quantified.